Though the Western States Trail Ride is most commonly referred to as the Tevis Cup, the name of the trophy presented to the overall winner of the 100-mile, one-day ride, Michele Roush says that, given the choice, she'd rather win the Haggin Cup. And considering she's a veterinarian, that personal preference seems an appropriate one. Roush wrapped up her third finish in six starts in the annual event on Sunday, crossing the finish line in ninth place and earning her prized Haggin Cup, the award presented to the top-10 finishing horse determined to be in the best physical condition following the ride. "I've always thought anybody can go out and ride fast," said Roush, a North San Juan resident. "To me, (the Haggin Cup) is a bigger deal than the Tevis Cup. It's judged on both horse and the rider. It's a comprehensive award." Roush rode Cayenne, a horse she first rode just months earlier in an endurance riding event in Nevada, in the 51st annual Western States Trail Ride, crossing the finish line at 12:12 a.m. Sunday morning - nearly 19 hours after starting the ride at 5:15 a.m. Saturday morning. "At that race in Nevada, I rode three different horses on three different days," Roush said. "And on that third day, I rode Cayenne. He did the Tevis last year, with his owner from Utah, so I knew he could do it. "One of his strengths is that he is very good downhill and the Tevis is a downhill race, pretty much." In January, Roush rode in the World Endurance Championships in Dubai, United Arab Emirates atop PR Tallymark, a horse owned and ridden by Steve Shaw of Santa Cruz in this year's Tevis Cup. "I didn't really know (Cayenne) really well, but I certainly know him better now than I did last Friday," she said. "He just goes and does his own thing. "Tallymark is high maintenance, where I have to do a lot of positioning with him to do his best. But Cayenne, just works it out and seems to do what he needs to do." Greenwood's Cathy Richardson claimed the Tevis Cup, as the first to the finish at Auburn's McCann Stadium, riding SMR Fif d'Or across the finish line at 11:06 p.m. Saturday. Richardson was also the 2001 winner of the Haggin Cup. Though complete results of the event are not yet available, Roush said that nearly 200 riders and horses started the event, with 88 finishing. Among the local finishers, Colfax's Char Antuzzi rode Galahad across the finish line at 3:28 a.m. Sunday, while Grass Valley's Kimberly Nunez was right behind, as she and Tenook's Magic Wind reached the end point at 3:30 a.m. Sunday. Grass Valley's Frank Smith rode his 10-year-old mule Batman to the finish by 3:30 a.m. The finish was Smith's eighth completion of the course. Robert and Melissa Ribley, also of Grass Valley, each finished the event at 4:58 a.m. Sunday, with Melissa riding Oak Hill Tidbit and Robert atop Oak Hill Rambler. Three other area riders and their mounts were pulled from the event at Robinson Flat, the 36-mile mark of the event. Penn Valley's Beverly Altevers and her mount Flash of Elegance were pulled from the race, as was Grass Valley's Ina Hutchings and Rebel Dancer, along with Colfax's Chuck Mather and Dance of Hallani. IN HEAVY rain Shaikh Majid bin Mohammed Al Maktoum won the FEI 160-km Euston Park Endurance ride sponsored by Emirates International Endurance racing. He rode the French bred mare, Al Wadha, on who his brother Shaikh Hamdan had won the 160-km ride at Newmarket last year. The 160-km course had been designed by James MacEwan and John Robertson who was also the FEI technical delegate. The ride started and finished at Euston House whose parkland was the location of the central vet gate. The route was divided into six loops 35-37-35-19-17 and 19-km. The first and third legs of 35km were over the same route as were the fourth and last leg of 19km. The courses ran over the farmland and woods of Euston Estate, courtesy of Lord and Lady Euston, and the tracks through Kings Forest courtesy of the Forestry Commission. The ride officials included Ian Williams, Director of Endurance at the FEI. He praised both the organisation and the course. ?A well organised and well run event which produced a top class 160-km ride. ?More incredible is that their were no gates to open and no road work, an accomplishment rarely achieved by rides in the UK. The numbers might have been few but the competitive level was very high.? At 5am on a cool summer morning 36 riders were flagged of by Maggie Maquire Vice-Chairman of Endurance GB, who also presented the awards. Two stalwarts of endurance in the UK, Lesley Dunn and Margaret McKiddie, led the first stage. Dunn went on to finish third on Franzara and McKiddie?s horse, Bonnie Anne, was eliminated lame at the end of the penultimate stage. From the second leg the UAE riders dominated the pace with Shaikh Hamdan, Shaikh Ahmed and Shaikh Majid leading. They were closely followed by their father General Shaikh Mohammed bin Rashid Al Maktoum, Dubai Crown Prince and UAE Minister of Defence, and his wife Princess Haya bint Al Hussein. In the later part of this leg Shaikh Mohammed retired his young horse Alidar whom he felt was not sound and Princess Haya also retired her favourite horse Al Aghar who was in top form. The three brothers and Mohammed Ali Al Shafar had established a comfortable lead by the end of the third stage but at the end of the fourth Shaikh Hamdan retired his mount Horisk De Grazette on the advice of Shaikh Mohammed who considered the horse had done sufficient and performed very well. The heavy rain was persistent as the three UAE riders completed the final two legs. The grey gelding Mukatel ridden by Al Shafar tired over the final stage to cross the finish third but was eliminated lame at the final vetting. The two brothers rode together over the final 19-km and crossed the finish simultaneously, Shaikh Majid just a length ahead. Shaikh Ahmed was riding a young horse, the French bred Jaysk, and he commented: ?I was not sure if he would succeed at this distance but he did, due to my father?s excellent training.? Only five riders completed and Dr Fred Barralet, President of the Veterinary Commission, said: ?A lot of retirements at the midway stage were made by riders who felt that distance was adequate for their horse who could well be competing in the Europeans next month.? The heavy rain that started at midday also influenced some riders who retired before the finish. Katie Smith, the recent winner of Florac, described the going as very slippery and very difficult. The winning ride time was 8.32.01 an average of 18.98kph. In fourth place was Spaniard Antoino Moreno who was riding the USA bred Jassas, owned by Shaikh Mohammed. The last rider to finish was Susan Hawes from the UK more than three hours after the winner. After a solid 16 hours on the Western States Trail Saturday and into Sunday morning, the top Western States Endurance riders celebrated Sunday afternoon at the Gold Country Fairgrounds. In a festive awards ceremony, Michele Roush took home the coveted Haggin Cup. Her horse, Cayenne, was judged to be the most fit horse among the top 10 finishers. Roush, from North San Juan, just slipped into the top 10, taking ninth and her mount won a very close vote among the Haggin Cup judges. "I just try to ride the horse for what that particular horse has," Roush said. "Yeah, there's always a thought in the back of my head that if I can get in the top 10, I'd like to show for best condition." 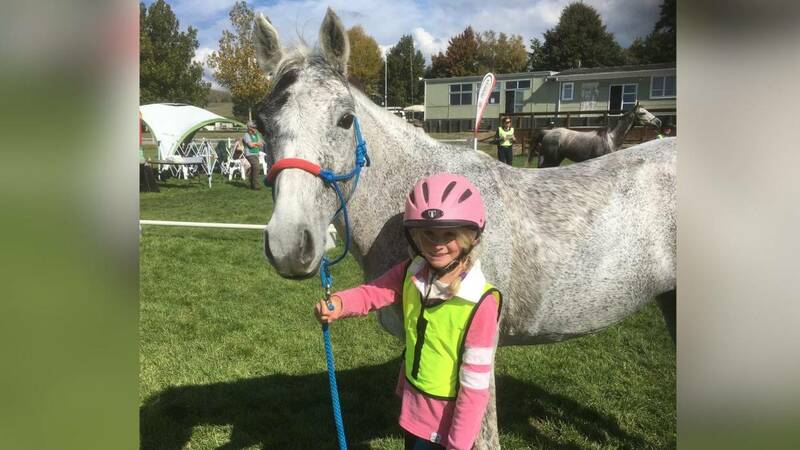 Endurance riding is a tough, demanding sport, racing a horse over an 80 or 160 kilometre course. Starting in the wee hours of the morning and with four vet checks required during the race it certainly isn't for the faint hearted. But Jas Carfter loves it. "What other sport can you ride through the mountains and watch the sunrise," she said. Crafter recently returned from the NSW State Championships in Manilla where she placed second in lightweight division on Neroli Mitchell's horse 'Bilbo'. Starting at 2am in the morning Crafter rode for 10 hours and 52 minutes to qualify for the Tom Quilty, the most prestigious endurance event in the country. Over 70 riders turned out for the event competing in four categories; lightweight, middleweight, heavyweight and junior riders. Carfter became involved in the sport four years ago through friends Neroli Mitchell and Peter Cooper. "This was my first 160km race, previously I've only ridden in 80km races," she said. And Crafter says she'll be a definite starter in the Quilty in Queensland next year. The sport requires a good understanding of you horses health. "Obviously you have to listen to how your horse is going," she said. "Your horse has a vet check the day before the race and four during it so if your push it too hard you'll get vetted out. "Myself and Peter (Cooper) are just always careful to listen to how the horse is travelling. "Towards the end of the race I was with the leader but Bilbo was doing it a bit tough so I pulled him up to scratch around to eat grass for about half and hour." Crafter says Arab horse are generally the best breed for endurance racing due to there slow heart rate and slow muscle twitch. She generally competes in the middleweight division which she says is more prestigious but rode in the lightweight for Neroli Mitchell to get racing points for 'Bilbo'. "I'm wasn't sore after the race because you have to be riding them everyday so they are nice and fit," she said. "You don't just go straight into a 160km race, you build them up over a period time running them in 40 or 80km races." The sport doesn't have a high profile but has been going since the 1970's according to Crafter. "There's no other sport like it," she said. "There would be a race on every weekend around the state but you don't really hear about it. The glory of finishing the 100-mile Tevis Cup endurance ride was escaping John Matthews as he sat hunched on the dirt floor of Auburn's McCann Stadium infield before dawn on Sunday. Seconds earlier, his legs had buckled and the Manhattan, Kan. rider had dropped to the ground while his horse was being examined by a veterinarian at the finish line. Matthews had made it. He'd get the silver buckle to show he'd ridden the Tevis trail - 100 miles in one day. But just barely. Matthews and his horse, Knight Legend, completed the arduous trek through the Sierra to Auburn as the clock ticked down the final second on the 24-hour deadline for finishers. Nursing a bottle of Sierra Nevada beer soon after his dramatic drop to the ground, Matthews joked that the ride had been a "piece of cake," but the pinched expression on his face and forced words betrayed troubles on the trail. "It was kind of a long trail ride," Matthews said, in deliberate understatement. The 69-year-old Midwesterner will go down in the record book as the 51st Tevis Cup ride's final finisher. The fact that Matthews and his horse finished at all turned into a testament not only to inner reserves of grit and determination but the willingness of others to help a fellow rider in trouble on the trail. Matthews was on track to finish the ride with minutes to spare. But after he dismounted near No Hands Bridge at the American River Confluence about five miles from the Auburn finish line, things went terribly wrong. His horse bolted up the trail, leaving Matthews nearing the end of the ride without a mount. "My saddle was slipping," Matthews said. "He got away from us and went down the trail. He wanted to go home." One of the oldest riders in this weekend's competition, 80-year-old Jim Steere of Petaluma, soon approached and temporarily put aside his own plans for the final ascent up the walls of the American River canyon to the Gold Country Fairground to help Matthews find his horse. Minutes later, Matthews' Wesob was found about a quarter mile up the trail. A rider farther along had caught the horse and tied its reins to a tree. Steere continued on, to finish seconds after 5 a.m. - and 15 minutes ahead of the 24-hour cutoff. Matthews struggled up the same route and beat the clock by the slimmest of margins, marveling at the help he received from the octogenarian Good Samaritan. "I didn't think I had a chance," Matthews said. "I don't believe I'll be riding when I'm his age. He's a marvel." With little over a half-moon to guide them, the final finishers in the Tevis Cup ride suffered no shame as they made their way into McCann Stadium. They were far from stragglers. In fact, the flow of finishers was relatively steady as the riders who had slowed their mounts and timed their trek finished at their own pace. Decatur, Texas rider Jonni Jewell arrived at the finish on Hank at 4:46 a.m. Jewell said that with no mountains to speak of in Texas, she brought her horse out to Southern California in June to get ready for the 17,000 feet of climbing it would face. The extra work paid off, with Hank stumbling on occasion over mountain trails but going the distance. "It was tough on him but he's tough - amazingly tough," Jewell said. Dave Rabe, of Carson City, Nev., celebrated with a Miller High Life at the finish line. Along the way, he was quaffing gifts of tequila, beer and wine from onlookers to help fuel the journey. "People out there are really nice," Rabe said. "If you're conservative and pace yourself you have a chance to finish." Rabe finished with about half an hour to spare - no disgrace in his books. "Who cares if you finish 20th or last?" he said. Tevis first-timer Logos Hall of Altadena logged a finish 10 minutes before the ride's official shutdown. "I started getting nervous (about finishing) this afternoon," Hall said. "We did one vet check at a time. There were some stumbles but she got right back up every time." Before an official finish, there was a final veterinary checkup at the stadium and then a chance to make a celebratory loop around the infield to the finish line. By 5 a.m. no one was in the stands to cheer on the finishers. Some took the victory lap with smiles denoting the victory they had achieved over the heat and rock-strewn dangers of the trail. About 250 horses and riders were signed up for the annual trek. Less than 90 finished. Veterinary checkpoints along the route could make or break a rider's chances for a buckle. With glow-lights the only signs of their movement along the trail, riders filed in to the Lower Quarry veterinary checkpoint as the final hours counted down. They were met by veterinarians like Chico's Jim Edwards, who has been volunteering for the ride for 37 years. At that point, veterinarians have to make tough calls on whether to keep a horse in the ride or pull it. Five horses were pulled out at the Lower Quarry checkpoint during this year's Tevis Cup competition, including two-time champion Potato Richardson's Garcon - a leader at the time and on track for a possible win. Edwards said Richardson's horse had fallen farther up the trail and when it rolled over, suffered shoulder cuts and a bruised muscle that left it favoring a leg. Riders know that veterinarian decisions are final and several horse doctors can be brought in to explain in detail why the call to take a horse out was made, Edwards said. "Usually they're very convinced that we're very convinced," he said. "Potato took it well." WINDOW ROCK ? Tom Robbins said it best in his book, "Still Life With Woodpecker": "It's never too late to have a happy childhood." Bearing this in mind, I set out for the 10th Annual Navajo Nation Council Ride which left from Navajo Mountain Chapter House on Monday, July 11, with a do-or-die attitude. The Tevis 100-mile endurance ride is more than just one rider, one horse these days. In its 51st year, the ride this weekend is a parade of high-tech equipment far removed from the 1950s and 1960s, when riders in cowboy hats, boots and western shirts spurred their mounts on the trail. Many of today's horses sport saddles padded with the same shock-absorbing materials runners pound the pavement with in the soles of their shoes. Their horseshoes can be just as much a plastic composite as steel. And for several years now, Tevis horses have been guzzling electrolyte drinks similar to Gatorade, as they make their way from Robie Equestrian Park, south of Truckee, to Auburn. High in feather-light, injection-molded saddles, riders' cowboy hats have been doffed in favor of lightweight helmets, padded and protective trail-running shoes have replaced cowboy boots, and running tights, shorts and sweat-wicking shirts from the endurance running world have replaced the jeans and pearl-buttoned Western wear of yore. For many horse-rider teams navigating the twists and turns, ups and down, and heat and cold of the Sierra, a global positioning system and heart-rate monitor are standard equipment. And canteens have given way to plastic bladders with flexible straws strapped to the back of riders. Pilot Hill's Steve Elliott was on the sidelines during this weekend's Tevis Ride, but as owner of Equine Performance Products he's on the cutting edge of many equestrian innovations. Elliott's working with a design factory in Italy on a new, high-tech saddle and was one of the early champions of GPS and heart-rate monitoring for horses. "It's like an onboard black box," he said. Elliott sees opportunities in the future to increase nutrition. Horses, like their human counterparts, are already gulping down glucosamine to strengthen and rebuild cartilage. But when the starting line is staring a rider in the face and a horse is prancing in the first light of dawn to set out, all the accoutrements of the modern world take second fiddle to some basic tenets. "It all comes down to good conditioning and luck," Elliott said. That means some of the high-tech tools are finding some resistance from riders in an event that is steeped in tradition. Three-time Tevis winner Hal Hall of Auburn, one of the veterans of the Tevis trail, doesn't use GPS but will strap a heart-rate monitor on his horse occasionally. Like many riders, he's a purist on the trail during the Tevis - riding not only to test his own mettle and the endurance of his horse, but riding against the best equestrians the event has put on the route over five decades. "I don't want to be regimented by a number," Hall said. "They can't tell us if our horse has a stomach ache or a sore foot." Hall was trying something new on this year's ride - reflective clothing designed to keep the UV rays off the body. Two-time champion Potato Richardson of Greenwood distances himself from the GPS crowd, who can track distance, elevations and temperatures with an onboard unit. "When I go out, I just want to have a good ride," Richardson said. "When someone says 'How far did you go?' I say 'I don't know.' Instead of more gadgets, I want to get to know the horse." Virginia rider John Crandell III, said he's played with the monitors and GPS systems but would rather be reading a twitch of a horse's ear than a digital read-out. "When the metal hits the road, I'm a minimalist," Crandell said. "Sometimes the numbers can distract you." Cool's Erin Klentos, another two-time Tevis winner, said that GPS is a benefit for on remote trails but in and around the Western States, she has no need because she's ridden those trails all her life. "And I didn't inherit my mother's ability to lose her car in a parking lot," Klentos added. Tevis: And the Winner Is?? Around 250 riders will line up with their horses for the 51st annual Western States Endurance Ride Saturday at Robie Park, near Truckee. They'll be competing against each other for the coveted Tevis Cup, which goes to the first finisher, and for the Haggin Cup, which goes to the finisher in the top 10 whose mount is judged to be the most fit. unrelenting in the deep canyons Saturday afternoon. While there are plenty of riders with great credentials and hundreds of great-looking horses, there isn't a clear favorite for Saturday's ride. "I never go to win," said Debbie Lyon of San Luis Obispo, who's finished six times. "I'm going to wait and see what kind of day the horse is having. If he's having a really good day and things go right, I wouldn't mind slipping into the bottom of the top 10. That would be really nice, but the goal is to finish with a sound, happy horse." Many participants at Wednesday's pre-ride barbecue echoed Lyon's sentiments regarding the heat. Riders from this area have had several weeks to adjust to the unusually warm weather. They may not have a home trail advantage, but it seems that California riders have had a distinct home state advantage in recent Western States Endurance Ride history. Last year, 19 of the top 20 finishers in the 100-mile ride hailed from California, the lone exception being Ali Kahlfan Abdulla Hamdan Al Jahouri from the United Arab Emirates. Los Gatos resident Jeremy Reynolds tied for the Tevis Cup last year and took home the Haggin Cup as well. Ride organizers assured there will be no ties this year, or in the future, changing the rules after last year, which was the third tie in the history of the event. Reynolds is back this year to defend his titles, along with his wife, Heather Reynolds, the 2003 Tevis winner. Auburn's Becky Spencer, who tied with Reynolds last year, is not entered in this year's ride, but third place finisher Lila Abdul-Rahim is back with her horse, Clancey. Fourth place finisher Gabrielle Mann is also returning with her horse St. Patrick. Auburn's Hal Hall, a three-time Tevis Cup winner and three-time Haggin Cup winner, will be riding Bogus Thunder after sitting out last year's Tevis ride. Ann Hall, Hal's wife, rode Bogus Thunder to a sixth-place finish last year. Potato Richardson and Cathy Rohm Richardson, of Greenwood, are back in the Tevis field. Cathy placed ninth last year and she's back on SMR Fifi d'Or for this year's ride. There are several husband and wife duos in this year's field, including Robert and Melissa Ribley, of Grass Valley. The Ribleys plan on riding together on Saturday. "I think our horses travel better together," said Melissa, who finished Tevis as a junior rider in 1981 and has since worked as a veterinarian at the event numerous times. "Horses are kind of herd animals and they're used to being in their environment with their stable mates, so I think they'll do well together. "We're looking forward to the challenge. I think it will be an extra challenge because of the heat, but we enjoy taking on the challenges." Marcia Smith, a veterinarian from Loomis, was planning on riding a young mare this year, but her horse came up lame recently and she was forced out of the ride. But Smith, who has three Tevis Cups and one Haggin Cup on her resume, knows what it takes to do well at Tevis. "It will be an interesting race because it's so hot this year," Smith said. "I think tactics will be key. I would probably go fast early, before it gets hot, and then go slower in the middle of the day in the canyons, when I'm afraid it's going to be exceptionally hot. And then I'd plan to go faster at night when it cools off again." There are several international riders that could be factors in the race for the hardware. Last year, Ali Khalfkan Abdulla Hamdan Al Jahouri, from the United Arab Emirates, rode to an impressive fifth place despite suffering a broken arm along the way. This year, Ali Al Muhairi, Abdullah Khamis Ali Saeed and Jaber Bittar will represent the UAE. Jacky Laurent, from Tahiti, adds a Caribbean flavor to the field. Peter and Penny Toft, of Australia will also ride and Peter is hoping for continued success after placing fourth in 2003. "I'm interested in how Peter Toft will do. He's here from Australia with Murdoc (his horse)," Smith said. "They were here two years ago and finished in the top 10 and they're back here together." Considering the scope of the field and the countless factors involved, predicting a Tevis Cup winner is a crapshoot. There has not been a repeat winner since Chris Knoch in 1994. Cool resident Michel Bloch held a sizeable lead in last year's race at Michigan Bluff, but his mount came up lame at Foresthill and he was forced to withdraw. Bloch is back on the same horse, Monsieur Joseph, hoping for better fortune this year. Chuck Mather, of Colfax, served as the Tevis Cup ride committee chairman, helping prepare for this year's event. He's also fit in time for training with his horse Dance on Hallani. The two have finished 12th, sixth and 10th in recent years and Mather is looking forward to Saturday's ride, despite the prospect of a very warm day. "I guess we'll find out if he's a heat horse," Mather said. One of the intriguing aspects of the Tevis Cup is the unpredictable nature of the event. As the ride unfolds Saturday, there are always surprises. "I suspect it's going to be a typical Tevis year in that the early frontrunners might not be the first finishers," Smith said. "The tactics are going to be more important than ever this year." For Madeleine Kirsch, once you've ridden the Tevis Cup, you have to come back for more. Even if that means traveling over five thousand miles to do it. Kirsch is one of 14 international riders who's traveled the globe to be a part of the field of 250 for Saturday's Tevis Cup Endurance Ride. The German native, who currently resides in Salzburg, Austria, is competing in her fourth Tevis Cup. She's finished in the top 10 twice, taking seventh in 2003 aboard Desha BL and finishing 10th in 2002 on Desha BL again. Last year, the 35-year-old Web designer took 37th atop Fausto BL. Nakheel, the Middle East region's premier property developer, has announced that it is the official sponsor of the prestigious 'Cuore Verde Endurance Cup' to be held in Perugia, Italy on July 16, 2005. The Cup is part of a three day event including a Grand Gala that opened the event on the 14th July, and the "Go to Dubai" conference on 15th July to promote Dubai as an investment destination. The events was opened by the Endurance Grand Gala on July 14th, held under the patronage of H.H. Sheikh Mohammed bin Rashid Al Maktoum, Crown Prince of Dubai and UAE Minister of Defence, and was attended by over 500 VIPs including executives of top Umbria and Italian companies, and politicians. The history of the race dates back to 1989 and the 'Nakheel Cuore Verde Endurance Cup 2005' is the country's biggest endurance race of the half-season. There will be around a 100 horses running in the Cup. The UAE team will be represented by Sultan Ahmed bin Sulayem, Executive Chairman Nakheel, who will be riding a horse from Sheikh Mohammed's stable. The race is split into four phases and tracks a distance totalling 120km. The first three phases will be sponsored by one of Nakheel's premier projects (The Palm, The World, and Dubai Waterfront), with the final phase sponsored by Nakheel Corporate. Editor's note: This is the first in a series of stories leading up to the 51st annual Tevis Cup ride, which begins Saturday. One of the toughest endurance tests of man and horse on the planet, the 100-mile Tevis Cup ride, is ready to run from Robie Park, near Truckee, to Auburn on Saturday. Nineteen-year-old Philip Giles, from Donaghadee, Co Down, is one of the latest talented young riders to receive financial backing from the Northern Ireland Sports Council, writes a correspondent. Philip, a member of the Irish Young Riders Endurance Squad is currently on the long list and hoping to compete for Ireland at the Young Rider World Championships in Bahrain in December 2005. Dave Hodgens says his passion for horses stems back to when he was five years old. He can still recall the days he spent sitting in front of his TV watching old westerns and becoming fascinated with the lifestyle of cowboys. Shows like Lone Ranger really got me interested in horses," Hodgens said. Watching him ride off into the sunset on his horse - it was the little things like that, which stimulated me to build the relationship I have with horses today." The organising committee of the Festival Mondial d?Endurance de Compiegne which will host the forthcoming FEI Open European Endurance Championships and the ?Mondial d?Endurance of 7 & 8 year old horses? this August abandons its sponsor, Warsan Stables from Abu Dhabi (UAE). This partnership has been signed last October for this international event. The OC abandoned this partnership for transparency and fairness vis-à-vis the world of equestrian sports that it wished to see respected. Indeed, a competitor from Warsan Stables was subject to proceedings last January following a case of doping at the FEI Endurance World Championships in Dubai (UAE). The FEI Judicial Committee had dismissed the positive medication case. Barbara Lissarague and the Fédération Française d?Equitation (the French Equestrian Federation), has appealed the decision of the FEI Judicial Committee to the Court of Arbitration for Sport (CAS). Barbara Lissarague (FRA) finished second in the Championship. We strongly support our rider Barbara and the Fédération Française d?Equitation to win the case and Barbara, declared as official winner. This is inevitable in the best interest of the sport. - and more recently in France, once again in the world of racing, where an investigation for doping is still underway, the Compiegne organising committee wished to free itself from all possible future criticism. Sponsored by Al Talia stables in Bahrain the WP Endurance Union will be presenting the only FEI 100 mile ride in the Western Province on 6 August 2005 at the Saldanha Military Academy stables. Shorter distances (60km/80km/120km) will also be presented. SHAIKH Khalid bin Hamad Al Khalifa yesterday finished eighth in Catous International Endurance Horseride Championship in France. He clocked seven hours and 34.58 minutes at an average of 16 kilometres per hour over a distance of 120 kms. A total of 104 riders from France, Spain, Britain, Luxembourg, Qatar and Brazil apart from Bahrain competed in the four-stage race. French rider Demide Sany finished first astride Miss Dance clocking 7:02.55. Spaniard Koumas Moulst crossed the finishing line second clocking 7.02.56 Bill Auckers was third in 7:03.24. Shaikh Khalid fell off his horse Sunway River in torrential rain but recovered soon and made an impressive finish. Royal Team captain Shaikh Nasser bin Hamad Al Khalifa quit the race in the first stage as his horse Bawara Shabbi suffered an injury. Bahrain's Hamad Al Marissi also quit to spare his horse Aloha Gooda any injuries. Meanwhile, Yusif Tahar and Fuad Jawhar managed to finish the race clocking 9:13.20 and 9:47.44 to finish 36th and 40th respectively. Settled back in a chair in his Loomis kitchen, sipping coffee and recounting his life as a horse show judge, Richard "Doc" Barsaleau is an equestrian legend. Barsaleau, who turns 80 in August, is a retired veterinarian, past college professor, cowboy poet and veteran of World War II. He also served as a judge for the 100-mile Western States Endurance Trail Ride in its early days and is a co-founder of Loomis Basin Horseman's Association. He's been known as "Doctor B" ever since his days at Colorado State University, Fort Collins where he received his doctorate of veterinary medicine in 1952. Barsaleau inherited his love for horses and horse culture from his father, Henry Barsaleau, who served in the 11th U.S. Calvary in Textile, Texas. "I was raised in the stable on the business end of a manure fork and with a curry comb and brush," Barsaleau joked at his 5-acre ranch dubbed "Riders' Rest" in east Loomis last week. "Some people catch the horse 'bug' and some people don't. I guess I caught it." Barsaleau practiced veterinary medicine in the San Fernando Valley in Southern California and Visalia, Calif., before moving to Loomis with his wife Maggie Barsaleau in 1970. According to Barsaleau, Maggie, who currently "does the books" for local vet clinics in Lincoln, Rocklin and Roseville, is the perfect match for him. "She's the greatest," Barsaleau says. "To put up with me she had to be. She's not a horse person but she let me be one. She's one in a million." Doc's first visit to Northern Califonia, however, came earlier. In 1961 when Wendell Robie, founder of the Tevis Cup ride, asked Barsaleau to help judge the competition. The two had met while judging a horse show in 1952 - something Doc did for 37 years - and Robie remembered his old cronie. "There's a lot that goes into endurance riding," Barsaleau said. "You're checking things like the preparation of the horse, its size, health and tolerance level. In endurance riding, the horse is your servant, and you'd better take care of it." That first year of judging was followed by five more, and eventually Barsaleau served as the event's main veterinarian as well. He competed in the event himself 16 times, completing the ride 14 times and taking home three top-10 awards. After moving to Loomis and retiring from his veterinary practice, Barsaleau taught animal health technician classes as Consumnus College in Sacramento and wrote the state's first board exam for veterinary technicians. He also helped start the Loomis Basin Horseman's Association in 1981 and has spoken at every Cowboy Poetry event in Loomis since its inception in 1995. On Sunday, Barsaleau received special recognition for his contribution to the area's horse community, when an outdoor pavilion at Robie Equestrian Park, located about 7 miles south of Truckee, was dedicated to him in during a ceremony there. The pavillion marks the spot where the 100-mile ride starts each year, and where riders frequently gather before heading off on the ride. According to Marion Arnold, president of the Wendell and Inez Robie Foundation granting the honor and grandaughter of its namesakes, Barsaleau was awarded the honor because of his incredible involvement with horses over the years. "(He has a) tremendous depth of knowledge about horses," Arnold said. "He always puts the horse first, which is very important in endurance riding. We think he is very worthy of recognition." While Doc's work with horses is restricted now - he has symptoms of Parkinson's Disease and has not ridden in a year - he remains active around his ranch, tending to his five horses and helping train young riders for the Tevis Cup, which takes place July 30 this year. Despite having worked with the animals his entire life, horses continue to play a theraputic and healing role in the life of this retired cowboy. "There's just something about putting your hands on a horse every day," Barsaleau said. "I love their smell, their attitudes and their beauty, and I enjoy helping people get the most out of their horses. "You know that old saying, 'The outside of a horse is good for the inside of a man'? I don't know why, but it's true." Sarah Langford can be reached at sarahl@theloomisnews.net. A thin cloud of white dust, churned by dozens of milling hooves, is rising lazily, obscuring the camelthorn trees in the grey light of dawn. As the horsemen launch off into the veld, grooms and supporters adjust blankets clutched against the cold and nurse tins of lager. It may only be 5.30am but it?s never too early for a tinnie at a South African endurance ride. The mere sight of alcohol is enough to set the head reeling after a night of downing Cape wine and Old Brown Sherry, between square dances to the sound of fiddle and accordion under a starlit sky. We are here to ?groom? ? or help with the horses ? for our Afrikaner friends, a young couple who breed Arab horses for a hobby. Hurbey and Johannie have promised that here we will see a different side to the traditionally dour Afrikaner, and get a taste of true hospitality. The farm at which the event is being held is beyond Zeerust, a town 200km northwest of Johannesburg on the border with Botswana. Unmarked dirt tracks have to be followed, turns made at crooked Jacaranda trees, farm gates with ?private property, trespassers will be shot? gone through. When we arrive, at a clearing in the middle of nowhere, it is like the meeting of a horsey secret society. Massive farmers squeezed into khaki shorts stride around in suede veldskoene, the tribe?s hallmark footwear. Their equally massive wives, squeezed into floral Crimplene, prepare vats of stew and pap (cornmeal porridge) over open fires. All of them eye us suspiciously. It is only once we have been rescued by our friends that the thaw, slowly, sets in. They introduce us to Rolf, an Afrikaner, yes, but slight, pony-tailed and quietly spoken. He is the current South African endurance riding champion. Endurance riding is the equine equivalent of a cross-country marathon. Horses and riders gallop through scrub and bush (the rides are sometimes set in game parks, to provide an added incentive to speed), up mountains and through rivers and sand. Arabs are the mounts of preference for their stamina and speed. Thoroughbreds are just too fragile. The riders, too, have to be tough. ?It?s an obvious sport for Afrikaners traditionally ? we like to test ourselves against the bush and even now if you farm it?s often easier to ride out to inaccessible places than to try and take motor vehicles,? Rolf tells us. The endurance riding season starts in January, South African summertime ? and ends in May. As its popularity grown abroad, international interest ? and money ? is beginning to flow into the sport in South Africa. Foreign riders, attracted by South Africa?s spectacular scenery and varied riding terrain, pay well to hire a good mount, and some competitors, such as Clint and Julie-Ann Gower, are offering tourists the chance to share their passion. The Gowers offer week-long riding packages at their stud on South Africa?s Wild Coast ? south of Durban ? built around participation in an endurance event. They are perfectly prepared to load guests and horses up and drive for hours to meets such as this one. But, as they themselves are quick to point out, what happens after the horses are tucked up at the end of the day is at least as important as the equine element. The endurance ride is to the South African horseman what the hunt ball used to be to his foxhunting UK counterpart. As the sun begins its African plunge to the horizon, there is a general rush to the bakkies, the pick-up trucks that are the vehicle of choice for serious outdoor enthusiasts here, and we take to the fuzzy green hills that peer across the border into Botswana. Bumping up tracks cut by livestock we finally arrive at the top of the hill just in time for that perfect gin and tonic (a generous concession to the English guests) as the sun goes down. Around us, but apart (reminding me of the famous dictum that an Afrikaner farmer feels his neighbour is too close if he can see his chimney smoke from his homestead) are other little groups savouring the view. A dark whirl of feather suddenly explodes from the track ahead; ?Look, a Mozambican nightjar,? calls our neighbour in English. We are touched that he cared so much to inform the tourists that he bothered to break out of Afrikaans. Back at camp, and fortified by alcohol, we are introduced. To our astonishment, there is general pleasure that rooineks ? the contemptuous name for the sunburnt British soldiers that fought in the Boer war ? are interested in Afrikaners at all. We are accepted into the tribe. At our own camp fire, ­Hurbey and Johannie make boerbrood: ?The best bread you will ever taste, man?. The dough is formed into little square buns and placed straight on the griddle to rise and cook. A friendly dispute arises with neighbours over whether this is in fact superior to their boer brot, which has been allowed to rise, then placed in a foil-covered tin and buried in the embers of their fire to bake. After the race on the second day, the real celebrations begin. Each group has its own barbeque, or braai, but bakkies and the tents are ranged around in a loose circle, in a modern day take on the ox-wagons of their forefathers. First there is the awards ceremony. Rolf has won again on his dainty little mare. ?Don?t call her a pony,? hisses Hurbey with concern. ?You never call an endurance Arab a pony, no matter how small it is.? Later, when we?ve all had too much to drink to know better, the band strikes up. At the end of a dance floor made from beaten earth and marked out by straw bales, four old men take up their fiddles and accordions and launch into sakie sakie, the Afrikaner equivalent to American square dancing. As couples flood on to the floor in jeans and checked shirts ? some men with small, evil looking hand-guns on their belts ? it strikes me that this is a scene straight from the Wild West. Change, it is true, has come. There are now some black riders in the events. But they are mostly grooms. None of them owns their own horses. ?Don?t go talking politics,? I am warned when I ask about this. ?It won?t go down well.? Many young Afrikaners like Hurbey and Johannie have embraced with enthusiasm the democratic South Africa that emerged 11 years ago. But the older generation often finds it hard to accept that years of privilege are over. On a cultural level, the rise of English as the country?s post-liberation lingua franca has added to the feeling that Afrikaner identity is, once more, under threat. ?Last time we were so hemmed in was by you Brits in the Boer War,? says Hendrik, a giant of a man, chaperoning his daughter at her first ride. ?But, d?you know what, Engelsman,? he calls to my husband, ?My grandpa beat you rooineks at Spionkop good and proper!? He bursts into laughter at the memory of a particularly ignominious British defeat during the war, then strides up and claps a hand on his back, while proffering yet another beer. Not for the first time, it strikes me that Afrikaners like to keep one veldskoene-clad toe firmly in the past. SHAIKH Nasser bin Hamad Al Khalifa leads the Royal Team at the Catus International Endurance Horseride Championship which will be flagged off in France today. The 120-km race is being held under the supervision of the International Endurance Federation. Spain will be lining up 15 riders in this six-stage race which starts at 8.00 am (Bahrain time). Brazil have three riders in the fray while Qatar two. Britain and Luxembourg will be each represented by one rider while UAE and the US are yet to confirm their participation. Shaikh Nasser will be riding Australian-based Bawara Shabbi which will be making its European endurance debut. Shaikh Khalid will be astride Sunway River. Royal Team members Yusif Tahar and Hamad Al Marissi will ride Australian-based Aloha Gooda and Sundry respectively while Fouad Jawhar will take part in the event on Sebastian. Khalid Al Ruwae will not be taking part in the race as his horse Jallad is injured. Two runners, a horse and a 35 mile championship trail race through the Kootenai National Forest is just a few of the challenges to capturing the 25th Ride and Tie World Championship. After only training with partners for two days, Becky Convery will attempt her first Ride and Tie. "It is a great challenge," Convery said. "I will try it out and I hope to have fun." The eventnn which is comprised of trail running, endurance ridding and strategynn will be held today, beginning at 9 a.m. near Libby. Convery, from Helena, is a novice horse rider, but excels in running half-marathons and trail races. Michelle Richardson, from Helena, will also be competing in the championship for her first time. Richards' partner, Pat Browning, is an experienced Ride and Tie rider from California. Convery said she found out about the Ride and Tie through a Montana road race calendar and researched the event from there. "When I went to the web site to see what it was all about I was immediately hooked," Convery said. Convery said she was introduced to her partner, Janet Dodd from Spokane, Wash., through the Ride and Tie Association. Convery and Dodd met and trained last weekend for two days. The training was the only time the two would be able to strategize and prepare for the championships. Convery then traveled to Libby on Thursday to attend pre-race events and make final preparations with Dodd. "We have similar running abilities and will try to split the running throughout the race," Convery said. "We are not sure of a strategy other than to do the 35 mile race." The Ride and Tie is not a new sport though it is not widely known. The organization has been in existence since 1971 to promote combined running and equine endurance. The goal of the Ride and Tie is to get all three team membersnn two humans and a horsenn across a cross-country course by alternating riding and running. The partners switch ridding the horse throughout the race while the other runner runs beside on the trail. Teams will be traveling from Virginia, North Carolina and Californiann where the sport began. Several teams have also entered from Canada to compete for the championships. Though it would seem as though there would be pre-qualifying for the world championships, Convery said there is no experience necessary to compete in the event. According to a press release from Carol Ruprecht with the Ride and Tie Association, anyone is welcome to compete in the championship and the event is open to novice competitors. "There is quite a mix of competitors," Convery said. "Some have been competing for 30 years and some are new." Convery said she ran in the Helena Governor's Cup in May and since then has been running about three miles a few times each week to prepare for the Ride and Tie. "Training is sporadic and short," Convery said. "I run a couple a days a week and my biggest distance training has been competing in half-marathons. "If it was not for the training in the Governor's Cup I would not be able to compete (in the Ride and Tie." The biggest challenge for Convery will be riding Rio, Dodd's horse. "I am an intermediate runner, but I have not ridden in 20 years," Convery said. "I have basic ridding skills." Rio will also be competing is his first Ride and Tie. Dodd has spent the past few weeks training Rio to follow instructions and riding long distances. Dodd has also been working with Rio to prevent being spooked. "The most difficult thing is to have the horse tired and spooked," Convery said. "Janet has been working on having someone follow behind Rio to prevent spooking." Convery said she has always been interested in horses, but has not much of an opportunity to ride. "I would like to have horses eventually and the Ride and Tie sounds like a great sport to incorporate some ridding." There will be prize money awarded to the top team in each category as well as an overall first place win by a pro-am team. A custom made eight pound horse saddle will also be awarded by a special drawing. The event will be videotaped for Horse-TV to be aired on a special broadcast at a later date. Michelle Mattingley of Scales Mound loves horses. She always has. And that love has led her towards another love, endurance racing. After 12 years of competing, she recently won the national championship at the American Endurance Ride Conference held in Ashland, Mont. This event was at the Circle Bar Ranch, a working cattle ranch that dates back to 1883. Mattingley's event followed a course through the ranch and into the Custer National Forest. Much of the course passed through various rock formations and followed Native American Trails. Having conquered the American race, she hopes to be invited to the world games in Aiken, Germany in 2006. Winning the race was a big accomplishment for Mattingley, but she has already earned other titles with the horses that she owns. For example, in 2001, she took a championship with a horse that she sold, which now lives in the United Arab Emirates. "Endurance racing is a family sport," Mattingley said. "Both my husband Joe and I compete in events, mostly in the Midwest, but winning the recent national award was pretty exciting." While she was happy to have the title from her most recent ride, she said one of the most coveted prizes to also receive is the Best Conditioned Award, given to the fittest hose in the competition. Her Arabian gelding, DSAristoi, earned that award. Endurance racing is a test of horse's condition and stamina and the rider's intelligence. The grueling test takes horse and rider long distances - 50 to 100 miles - over varied terrain. Because of the rigor of the race, it is done under veterinary supervision. It also takes a "pit crew" to compete in endurance racing. Sometimes crew members accompany Mattingley to the race and other times she is able to assemble a team at the race site. Endurance horse racing, like car racing, has pit stops to water and cool the horse before getting back on the track. A veterinarian examines each horse for any soreness or change in attitude, pulse, respiration and other physical factors. Failure to meet any of these criteria for racing can stop a horse from completing the course. The American Endurance Ride is a 100-mile course, Mattingley said, that must be completed within 24 hours. A 50 mile course must be completed in half that time. The first racer to complete the course with the best time wins. "As a horse lover, endurance racing allows me to not only ride one of my horses, but it also allows me to do this in some beautiful areas of the country," Mattingley said. "This type of racing is a team effort. You really have to know your horse. It is about trust. "My husband and I have competed in the deep sand dunes of Manitoba, Canada and hard-packed the mountains of Vermont," Mattingley said. "We have also ridden the terrain of the Smokey Mountains and the flat sandy trails in Florida." Mattingley said that it takes years of training to build up the trust that is needed to take a horse to an endurance competition. "Endurance racing is an extremely challenging sport," Mattingley said. "I spend many hours working with my Arabians, making them an athlete. The training is rigorous." Tucked away in the hills of Jo Daviess County, Mattingley trains her horses. She and Joe live in a picturesque part of the county that offers up just the right training ground. Horses graze along the hillsides visible from their long, twice-gated lane. "Our property offers up just the right hills ... for training," Mattingley explains. "We have over five miles of trails that we use for training." Mattingley grew up in a city and once she fell in love with horses, she says she couldn't wait to move to the country. After she graduated from college, her first big purchase was a horse. She bought a thoroughbred from the Arlington track. At her first competition in 1993, her horse did well during the 25-mile test, but she learned a thoroughbred is not the type of horse she needed to go further. She bought herself an Arabian and has been "hooked ever since." Both Mattingley and her husband hold down full-time jobs, but it is at the end of the day that they start the work they really love: their "full-time passion" for raising and training the 30 Arabian horses they own. Sporthorse Concepts is what they call their business, which includes brood mares and a stallion. With each competition that Mattingley enters, she keeps a different goal in mind. "All courses are different and we have had our share of bad luck, too, " she says, adding, "DSAristoi, the horse I won the championship with is undefeated. I have a good feeling about being able to compete at the world level with him. That is my goal, to win the world games. That would be the ultimate challenge." Mattingley says raising, training and racing horses is a big job for her and her husband. "The horses are our life, it is our focus," Mattingley said. AL Khaldiya Stables captain Shaikh Khalid bin Hamad Al Khalifa yesterday won the 'Youngest Arab Rider' title after taking part in the Florac International Endurance Horseride Championship in France. Riding Asterida Izba, Shaikh Khalid finished 20th in the six-stage race held over a distance of 160 kms. The race, which started at 4am yesterday, witnessed a strong European participation who competed against the Roay Team riders and UAE's contender Adnan Sultan Al Nuaimi. Royal Team rider Yusif Tahar also managed to finish the race despite experiencing difficulties, particularly in the second stage. Meanwhile, Hamad Al Marissi, who was riding Sunway River, quit in the second stage. The Royal Team left for the Catous region to train for the next race to be held on Saturday. His Majesty King Hamad congratulated Shaikh Khalid on his achievement. DUBAI ? Orkara, bred and owned by General Shaikh Mohammed bin Rashid Al Maktoum, Crown Prince of Dubai and UAE Minister of Defence, with Katie Smith aboard won the Florac endurance ride in France. Florac, one of the oldest rides in France dating back to 1976, is considered by many as the most difficult one in Europe. Orkara, sired by Bakara, a full brother to Cheri Bibi the sire of Bengali D?Albert, a brilliant Arabian racehorse owned by Shaikh Hamdan bin Rashid Al Maktoum, Deputy Ruler of Dubai and UAE Minister of Finance and Industry. Orkara, a nine-year-old pure Arabian bay gelding, started his life as a racehorse trained by Bill Smith in the UK. He achieved moderate success on the racetrack which included a win at Stratford (UK) in 2001. Smith describes him as a very good looking horse beautifully proportioned but a ruffian and arrogant and aggressive horse not an easy ride. When his racing days ended Smith sent him to Pierre Morvan in France for endurance training. In 2004 he completed a 120km ride at a very slow pace then in April this year Orkara finished sixth with Morvan over 160km at Le Vigan in France. Smith said this win was much unexpected as the horse had been entered just to see if he could cope with the extremely tough conditions. It was Smith?s daughter Katie that triumphed on Orkara, entering the record books as the first British rider to win Florac in its 30 year history. Smith is a talented rider having won major events in three equestrian spheres Arabian Flat racing, Hunter showing and endurance on a global scale. This world famous French ride that was motivated by the Tevis, the Mother of Endurance, in 1984 Florac was the venue of the first European Championship. It is currently organised by a newly-formed organisation, Association Equestrian Lozere Endurance (LEE) and W?rsan Stables Abu Dhabi were one of the major sponsors. Orkara true to form was aggressive from the start where he tried his best to dislodge Katie. They were in the leading trio from 77 entries over the first stage of 33.5km ridden by the light of the moon. Katie and Orkara moved into pole position over the second stage of 43.3km the longest which included the climb to the summit of Mount Aiguoal. They set out with a four minute advantage on third stage of 22.5 km which they maintain as they set out on the fourth stage of just 15.5km, the shortest but the hottest part of the day. Katie led a group of four riders who finished this leg at the same time. Three of the group Smith, Pascale Dietsch (second place finish) Denis Pesce (third place finish) rode together over the penultimate stage of 18.9km and left together on the final loop of 20.4km which started with the long climb to the Collar of Montmirat christened ?The Justice of The Peace?. The fourth rider Catherine Roland was eliminated after the fifth stage. UAE rider Adnan Sultan Saif Al Nuaimi, director general of Abu Dhabi Equestrian Club finished 25th out of the 30 riders who completed the ride which also included Shaikh Khalid bin Hamad Al Khalifa of Bahrain in the 20th position. Just prior to receiving the trophy, a jubilant Katie overwhelmed by her success, commented: ?I can?t believe it. It?s unreal. ?He just charged off at the start. ?I had to let him choose his own speed as he would waste too much energy if I fought him. He was just fantastic as he powered up the mountains. ?The last loop was the hardest a 10km climb then a very step descent. Three of us were riding together. We planned to take the descent slowly but suddenly four riders galloped up behind us so it turned into flat race over the last two kilometre.? No doubt Orkara?s aggressive nature was an asset as he fought any horse that challenged his supremacy and Katie?s skill as a flat race jockey were a great attribute at this time. Only fractions of a second separated the winning trio who had averaged 14.60kph. Surprisingly Katie, a member of the British team for the last European and two World Championships, has not been selected by Endurance Great Britain for the Endurance Championship at Compiegne during the month of August this year.